It was “Earth Day” at the OB Town Council’s meeting, last Wednesday, April 22nd, or I should say ‘Earth Night’, as it was fairly late in the evening by time the main agenda item – presentations by environmental advocates – came around before the unusually-sparse crowd. That left Roger Kube of the Surfrider Foundation to give the main talk, and he did a fine job. 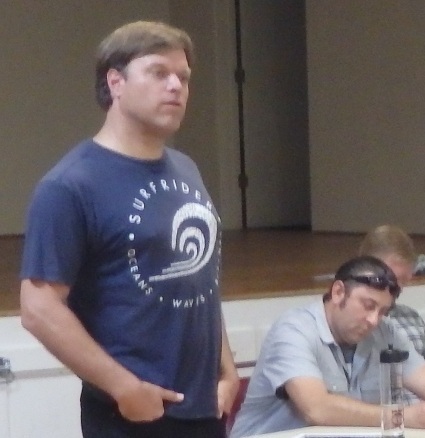 Kube – an OBcean and former president of the local Surfrider chapter – explained some, of the local organization’s main environmental issues. Roger Kube of Surfrider Foundation. First up is the development of a waste water, recycling program for potable water, Roger iterated. Surfrider Foundation has been advocating for this for 15 years, he said. San Diego receives a waiver every 5 years to not upgrade its waste treatment plant in Point Loma, and Surfrider has been lobbying the EPA to not grant the waivers. Now, current plans for recycling will result in San Diego recycling wastewater to drinking water, so that in 20 years, 40% of our potable water will come from recycled water. Finally, Kube got into one of his favorite projects, the plastic bag ban. San Diego has not passed the ban yet, he said, but it will be coming up before the City Council in 2 to 3 months, probably in August, and he urged people to turn out and pressure the Council to enact the ban. He believes that the concept has 5 “yes” votes on the Council currently, and right now the ban is falling along partisan lines. Surfrider has not confirmed, Kube stated, Councilwoman Zapf’s position. He implied that OBceans ought to call Zapf’s office and urge her to support a ban. Roger was fairly incensed at the opposition to SB 270 which was signed by the governor last December enacting the state wide ban, which is spending $2.3 million to gather signatures to repeal the law and place it on the November 2016 ballot. On other issues, Kube said the local chapter is definitely against fracking, but has no stance on agribusiness and the drought. He did make the point that he and the organization believe desalinization plants should be the “last resort”- as they had fought the Carlsbad project for years, and they still don’t think what was built is a good model. Kube did get into another new program of Surfrider: the “Rise Beyond Plastic” – an ocean-friendly restaurant program, where eateries voluntarily reduce their dependence on plastic utensils. The criteria for restaurants to be able to quality for the program, receive their designation, etc, is very high, Kube said. The standards include no Styrofoam containers, have re-usable tableware, and employ proper recycling practices – plus there’s another 6. There is one restaurant, he said, in Ocean Beach, that has qualified – Wonderland. He asked people to get their favorite restaurants on board the program as patrons. It was late, Kube was finished and he sat down to hardy applause. In tune with the spirit of the evening, Ingolia had announced that the Town Council had passed a resolution in support of the Climate Change Mobilization efforts. News Editors; it’s over and only unstoppable disbelief is certain now. It’s been 34 years of climate action failure at achieving the targets needed to “save the planet” 25 years ago. 34 more years of “could be” was not sustainable in “belief”.